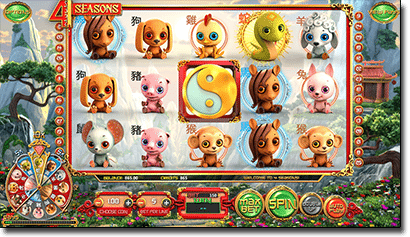 4 Seasons is the first 2016 release as part of BetSoft’s celebrated Slots3 collection. This exquisite 3D pokies game is themed around the Chinese zodiac, made up of cute animal symbols representing the Chinese year of the monkey, rooster, rat, tiger, rabbit, horse, dragon, ox, goat, pig, dog and snake. Set against a beautiful seasonal landscape along with soothing background music, 4 Seasons is not only spectacular looking but is jam packed with bonuses. 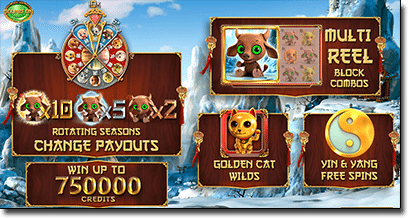 4 Seasons is a five reel, 30 payline 3D pokies game featuring wild symbols, scatters, free spins and multiple unique bonus features. Set your bet using the plus and minus symbols on the ‘choose coin’ and ‘bet per line’ buttons, or press the ‘max bet’ button to place the maximum allowable wager per spin. You can also use the auto-play function to automatically place up to 150 spins per session. To customise settings, click the ‘options’ button in the top left hand corner of the game screen to alter the sound effects, music, video quality and enable turbo-play mode. Wilds – the games wild is the golden Maneki Neko cat symbol which substitutes all other symbols to form a winning combination except for the Yin Yang scatter symbol. An appearance of five wild cat symbols across an active payline will pay the jackpot of 10,000X the active bet. Scatters & free spins – the yellow Yin Yang symbol acts as the scatter symbol, which is responsible for triggering the free spins bonus round. If three or more Yin Yang symbols appear anywhere across the reels, free spins are triggered. Three scatters will earn eight free spins, four scatters will earn 12 free spins and five will earn a total of 20 free spins, all of which can also be re-triggered. Double Up – the Double Up feature is similar to the standard gamble feature often found in pokies games, but instead of using the classic red or black guess format, 4 Seasons uses a Heads or Tails format. After any winning spin you’ll have the option of clicking the Double Up button at the bottom right corner of the reels to guess whether the hidden panel will be heads or tails. A correct guess will double your winnings, while an incorrect guess means you’ll lose your winnings. Upon a winning guess you can continue to Double Up as many times as you like. This feature is not available during free spins. Seasonal Wheel – the Seasonal Wheel is the zodiac wheel located in the bottom left hand corner of the game. After every 30 spins, the wheel will rotate to change to the next animal in the zodiac and this animal will turn gold while the animals appearing directly to its left or right turn silver and others turn bronze. An appearance of the selected gold animal will bring 10X your bet, while silver animals will award a 5X multiplier and bronze animals will award a 2X multiplier. After every 90 spins the seasons will also change. Note that free spins will not count towards the progress of the Seasonal Wheel. Block Win Combos – the animal symbols can appear as stacked symbols on the reels, which will result in the addition of a multiplier. Two stacked symbols results in a 2X multiplier, three in a 3X multiplier, four in a 5X multiplier and five in a 10X multiplier. Block win combinations can happen in addition to Seasonal Wheel symbol multipliers. BetSoft’s Slots3 collection can be found at a number of leading online casinos, including those recommended in our casino table above. We love Mucho Vegas for BetSoft slots, which are available for instant-play with no downloads required. For more great online slot games from BetSoft and other software providers, check out our online slots review page. 4 Seasons is the perfect example of why we love BetSoft games so much. Not only is the animation top-notch and as engaging as watching a 3D animated film, but with bonuses that build up every single spin thanks to the Seasonal Wheel there isn’t a dull moment. The Double Up feature means there’s always the chance to boost winnings along with increasing the suspense levels, which really enhances player engagement. While 2016 saw the release of several new pokies titles, many failed to bring the standard of bonus features and innovative additions that we see here in 4 Seasons.